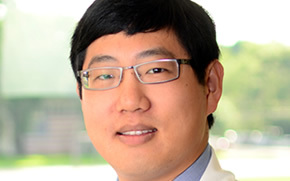 Daniel Hsia, M.D. is an adult and pediatric Endocrinologist and a member of the Clinical Trials Unit. His research interests are rooted in the prevention and treatment of obesity and diabetes in the pediatric population. During his Endocrine fellowship, he worked with adolescents who were undergoing bariatric surgery and was interested in the mechanism of rapid improvement of blood sugars in patients with diabetes after bariatric surgery. Since coming to Pennington Biomedical, he has been involved with a number of clinical trials translating approved therapeutic options for adults to children and adolescents. He is also an adjunct faculty member in the Pediatric Residency Program at OLOL Children’s Hospital and assists with their research program. Clinically, Dr. Hsia sees patients in Baton Rouge at OLOL where he cares for adolescents and young adults with diabetes. He is interested in the pediatric to adult transition of care for patients with chronic Endocrine disorders and especially type 1 and type 2 diabetes.